The valves turn one hydraulic circuit into two with a 15 or 40 GPM flow at a reasonable price. This valve plumbs into the existing hydraulic lines between the directional control valve and cylinder. The valve can be mounted anywhere. For example, on a front end loader this valve would mount on the boom to add a grapple function.The optional Control Grip Handle, Foot Pedal or Toggle mount in the cab for easy operation. All you do is move the handle to direct the flow for your primary function or press the switch and direct the flow for your secondary operation.Warranty: 6 months from date of purchase on manufacturing defects. 1. Decide where you want the valve mounted. There are two 5/16" holes predrilled in the block for easy mounting. 2. The blocks are coded for correct hose hook up. Port 1 is normally open, port 2 is normally closed and port 3 is input. Ports for the 15 GPM Rabbit Valve are SAE -8. Ports for the 40 GPM Rabbit Valve are SAE -16. We suggest swivel hose fittings for easier installation. 3. The ports marked #1 accept the hoses for the first function and the ports marked #2 are for the second function. 4. Mount the control grip, foot pedal or toggle in your cab. Spacers or shim may be required to adapt our control grip to your lever. 5. 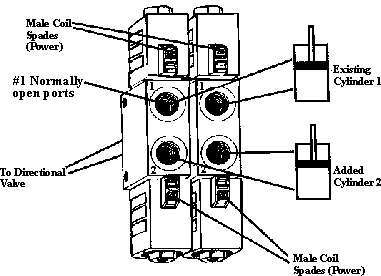 Run the control wire to the blocks and connect all four of the female terminals to the male spades on the coils. The red wire is your "hot" wire for connection to a 12V or 24V power source. A ground wire to the tractor may be required if the valve is mounted on the implement. Note: If a white lock on switch is used, connect power to the ignition switch.6. Bleed the hydraulic system to remove all of the air.Please change your hydraulic oil and filter to manufacturers specifications to avoid any contamination problems.